Microsoft is of the largest tech giants, which in 2017 made $89.9 billion in revenues. While Microsoft Office remains the most successful product. Other parts of the business related to advertising, with the Bing search engine, has been growing fast in the last couple of years. Also, the acquisition of LinkedIn has allowed Microsoft to enter the social media market. As a dominant tech company, Microsoft tries to keep innovating and acquiring companies that allow it to enter new markets, quickly. What is the Microsoft pay mix? How much money does Bing make? What are the Microsoft distribution channels? Does Microsoft spend more on Research and Development or Sales and Marketing? What are Microsoft top products and services? While Paul Allen accepted – for some reasons – the 60-40 deal, so that more shares would go to Bill Gates – mostly on the basis that Bill Gates had contributed more on the code – Bill Gates tried again to get hold of more shares of Microsoft. That attempt though wasn’t successful. In a few years, Microsoft would become the dominant tech company in the world. It is important to remark this is the side of the story told by Paul Allen, seldom mentioned Microsoft co-founder. The accounts from Paul Allen reflect his perspectives on Microsoft in its first years. While the three principal individual investors are Bill Gates, Mason Morfit, Satya Nadella and a few others among the board members (this list does not comprise those individual investors with a stake lower than 5% of the company if they are not board members). The most prominent institutional investors are The Vanguard Group and Blackrock. Based on that Microsoft compensation comprise 73.2% of base salary, followed by 19.2% of cash incentives, and 7.6% of equity. Office Commercial, including Office 365 subscriptions and Office licensed on-premises, comprising Office, Exchange, SharePoint, Skype for Business, and Microsoft Teams, and related Client Access Licenses (“CALs”). Office Consumer, including Office 365 subscriptions and Office licensed on-premises, and Office Consumer Services, including Skype, Outlook.com, and OneDrive. LinkedIn, including Talent Solutions, Marketing Solutions, and Premium Subscriptions. Dynamics business solutions, including Dynamics ERP on-premises, Dynamics CRM on-premises, and Dynamics 365, a set of cloud-based applications across ERP and CRM. Server products and cloud services, including Microsoft SQL Server, Windows Server, Visual Studio, System Center, and related CALs, and Azure. Enterprise Services, including Premier Support Services and Microsoft Consulting Services. Windows, including Windows OEM licensing (“Windows OEM”) and other non-volume licensing of the Windows operating system; Windows Commercial, comprising volume licensing of the Windows operating system, Windows cloud services, and other Windows commercial offerings; patent licensing; Windows IoT; and MSN display advertising. Devices, including Microsoft Surface, PC accessories, and other intelligent devices. Gaming, including Xbox hardware and Xbox software and services, comprising Xbox Live transactions, subscriptions, and advertising (“Xbox Live”), video games, and third-party video game royalties. Microsoft develops most of its products and services internally through the following engineering groups. Office Product Group focuses on Microsoft business across productivity, communications, education, and other information applications and services. Artificial Intelligence and Research, focuses on Microsoft AI development and other forward-looking research and development efforts spanning infrastructure, services, applications, and search. Cloud and Enterprise, focuses on Microsoft cloud infrastructure, server, database, CRM, ERP, management and development tools, and other business process applications and services for enterprises. Windows and Devices Group focuses on Microsoft Windows platform, applications, games, store, and devices that power the Windows ecosystem. LinkedIn, focuses on services that transform the way customers hire, market, sell, and learn. From its financial statements you can see how Microsoft has netted almost $90 in billion in 2017, compared to over $93 billion in 2015. Among the four primary business operations, Productivity and Busines Processes netted over $30 billion, while Intelligence Cloud netted over $27 billion and More Personal computer netted over $38 billion in 2017. LinkedIn revenue was $2.3 billion, primarily comprised of revenue from Talent Solutions. LinkedIn contributed to the almost four billion growth in productivity and business processes for Microsoft in 2017. 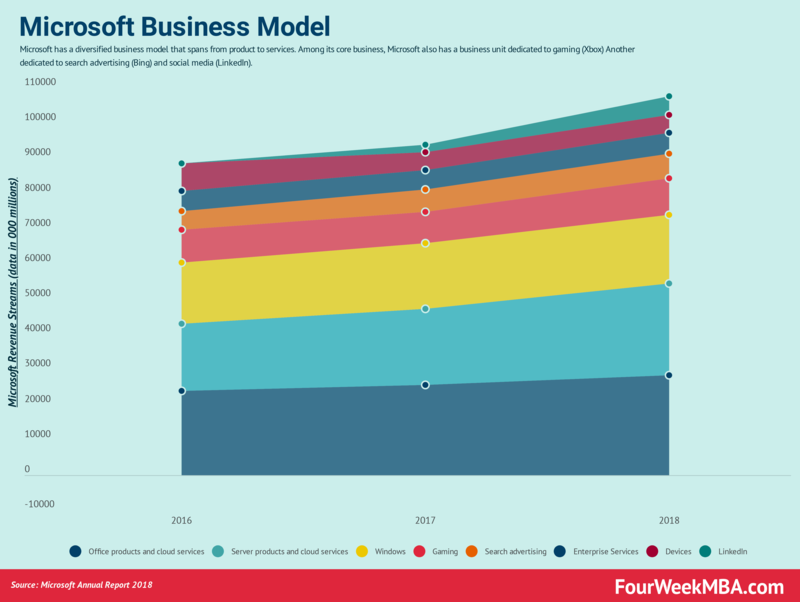 Server products and cloud services revenue rose to $2.5 billion or 13%, driven by Azure revenue growth of 99% and server products licensed on-premises revenue growth of 4%. Thus, the increase in revenues for the intelligent cloud is primarily due to Azure growth. If we look at the advertising revenues generated by Microsoft – which can be primarily attributed to Bing – those amount to $6.9 billion in 2017. That makes Bing a large piece of the pie for Microsoft overall revenues. However, if we compare Bing advertising revenues with Google’s over $95 billion for 2017; you can understand that Bing is still a minor player. However, Google’s advertising revenues also comprise YouTube, for which we don’t know the revenue breakdown yet, but we can assume to be at least a $15 billion business a year. OEMs, OEMs that pre-install Microsoft software on new devices and servers they sell. The largest component of the OEM business is the Windows operating system pre-installed on devices. Direct. Microsoft offers direct sales programs targeted to reach small, medium, and corporate customers, in addition to those Offered through the reseller channel. A large network of partner advisors supports many of these sales. Distributors and resellers, license Microsoft products and services indirectly, primarily through licensing solution partners (“LSP”), distributors, value-added resellers (“VAR”), OEMs, and retailers. From the revenue standpoint, Microsoft Office remains the most successful product. The game console Xbox also plays a key role in Microsoft financial success. While Advertising, mainly through the Bing search engine has been growing fast in the last couple of years. Also, the acquisition of LinkedIn has allowed Microsoft to enter the social media market. During fiscal years 2017, 2016, and 2015, research and development expense was $13.0 billion, $12.0 billion, and $12.0 billion, respectively. These amounts represented 14%, 14%, and 13% of revenue in fiscal years 2017, 2016, and 2015, respectively. Microsoft plans to continue to make significant investments in a broad range of research and development efforts.